With the NBA All-Star Game just on the horizon, fans with Knicks tickets are anxious to see if any of their favorite players are heading to Houston for the marquee event of the regular season. Forward Carmelo Anthony has already been named a starter, as the six-time All-Star is in the midst of one of his best seasons in the league. 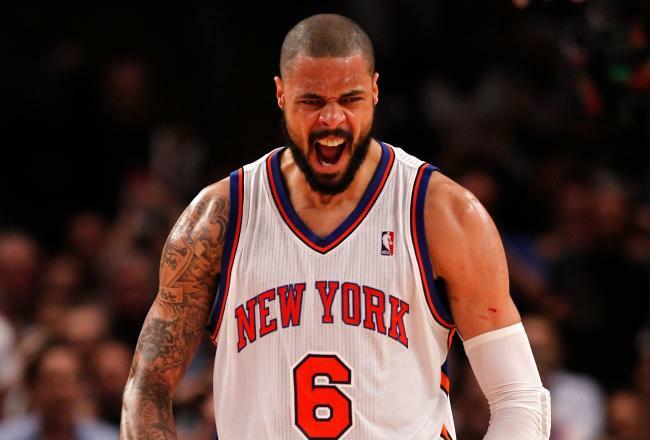 However, he is not the only member of the Knicks deserving of a spot on the roster, as center Tyson Chandler should be an easy selection for one reserve spot. It’s hard to believe, but the 12-year veteran has never been an All-Star, despite consistently ranking as one of the best interior defenders in the league. In fact, not only did Chandler win NBA Defensive Player of the Year honors a season ago, he was also named to the All-NBA third team, and has appeared on the All-Defensive team list for two seasons. While he was somewhat injury plagued earlier in his career, he has managed to stay fairly healthy for the last three seasons, and has made a huge impact over that time. Chandler was the main defensive catalyst for the Dallas Mavericks during their championship run in 2011, and carried that reputation with him to New York, where he helped transform a weak defensive team into a strong one. He is equally adept at helping in pick-and-roll situations as he is at challenging shots at the rim, and his energy and leadership on this end of the court is invaluable to coach Mike Woodson and his teammates. Chandler is also an underrated offensive weapon, with his .674 shooting percentage leading the league by a wide margin. There are a number of players in the Eastern Conference worthy of a spot on the team, but Chandler’s body of work and current production make him more than worthy of the long-awaited honor of NBA All-Star. This entry was posted in NBA Tickets and tagged knicks tickets, nba all star game, new york knicks by promc58blog. Bookmark the permalink.